I have a confession. At night I watch cartoons on Adult Swim until I fall asleep. One of the most bizarre cartoons they show at night is called Rick and Morty. It's about a grandfather who's some kind of scientific genius dragging Morty all over the universe. The other night, there was an episode about a group called Unity. It's this being or consciousness that's constantly replicating itself. It does this by vomiting in the mouths of its victims and taking over their bodies. See the video below for an example. You may not be surprised that I saw parallels to our union, what with the organization having the exact same name. 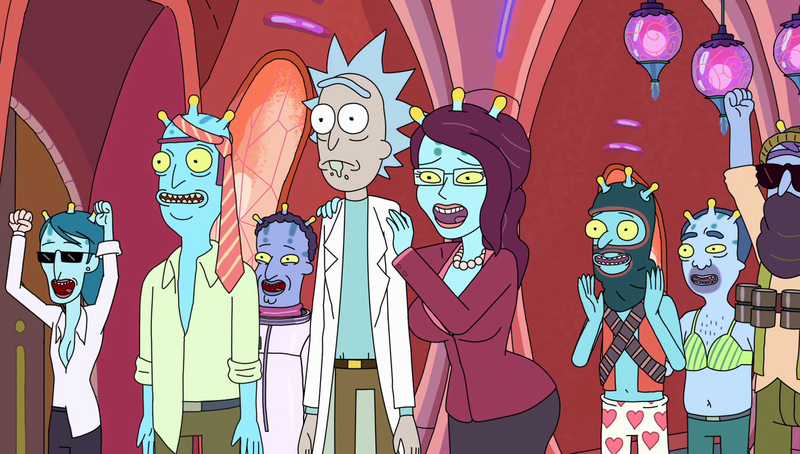 The pale looking guy in the middle is Rick, and all the blue people around him are Unity. So that could be me at a chapter leader meeting, except for the scientific genius part. Of course this episode took it a little further. Evidently Rick was having an affair with Unity, seemingly in the form of the young blue woman to his left, your right. Now as far as I know, signing up for UFT Unity does not entail having someone vomit in your mouth. Rather, it entails signing this loyalty oath, which used to be available on the Unity website. For some reason, they took it down after PJSTA posted it publicly. The best way to advance in the union is to sign it. If you don't, well, that pension consulting gig might elude you. I'll tell you the truth--I really like some people in Unity. I'll tell you another truth--I really don't like some other people in Unity. They don't seem to have a code about how they treat non-Unity members. So some people in Unity are reasonable and open, while others are kind of defensive and proprietary. I figure it's better to be reasonable and open, particularly if you purport to represent the union, but that's just me. Now I understand forming a political caucus. I'm part of one, as a matter of fact. I also understand espousing a particular series of values. I share a lot of Unity's ostensible values. I'm absolutely pro-teacher and pro-union. I don't believe in abuse by administrators, and I think we need to take a stand against Boy Wonders (even if they're girls). I certainly understand the argument that, in times of crisis, we need to pull together. The only thing is, I can't recall when we were not in crisis. It wasn't time to oppose when we were facing Bloomberg, or Cuomo, and it isn't time to oppose when we face Trump, or "the Presidential Election," as Unity calls him. I can only suppose it wasn't time to oppose when we faced Giuliani either, though I wasn't involved with union politics back then. Is the answer, then, to keep your mouth shut forever and ever and just hope for the best? Of course not. Unity is wrong sometimes. The Democrats, with Unity's early endorsement, lost the last national election because they presented the populous with a warmed-over agenda that consisted largely of, "We aren't Trump." In fact, I voted for Hillary in the general precisely on that basis. But I enthusiastically pulled the lever for Bernie Sanders in the primary. We're gonna have to pull out all the stops after Janus. It might not be good enough to say, "Well, you still have a job," when you're sent out to teach subjects you don't understand and rotate schools week to week. It might not be good enough to say, "Well, we did the best we could," when Moskowitz takes over your school and places a non-union test-prep factory in its stead. It won't be good enough to hear "Fifty years ago we sacrificed money for class size regs," while you stand in front of 50 kids in a trailer and try to persuade them that anyone other than you takes them seriously. And whether Unity knows it or not, that's why a vibrant opposition is necessary. There are voices that need to be heard, and with three out of four teachers not even voting in union elections, I'm not highly optimistic union is a prime concern for them. We all sink or swim together, and I'll work toward the latter. If we want everyone to pay union dues, we're gonna have to stop pandering toward a privileged class. That's the sort of thing that empowers the likes of Donald Trump, and it ain't gonna work for us.